Agriculture is the bedrock of society built upon the work of farmers over thousands of years. But, as we journey deeper into a rapidly evolving and expanding 21st century we face big challenges. We lay witness to a revolution in farming one that views of lifetime's of experience with innovative modern technologies to build a richer abundant and sustainable future. Agricultural professional must embrace revolutionary strategies for every aspect of innovative farming to increase food productivity, and make sustainability a priority. Drones are part of the sophisticated solution, along with closer collaboration between governments, technology leaders, and agriculture industry. Here are top 3 drones helping to support global growth of sustainable agriculture and food production. With DJI drones, they've made flying easier, more reliable, and smarter. 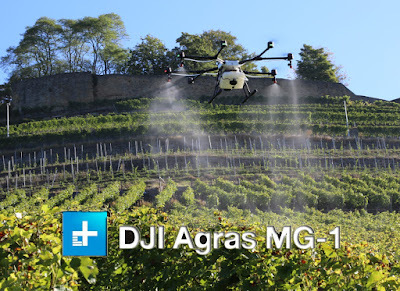 Now, DJI is bringing this expertise to the world of agriculture with the DJI Agras MG-1, the first agricultural aerial platform designed for ultimate effectiveness industry level reliability and precision strain. On a single charge, DJI Agras MG-1 can carry 10 kg of fluid can cover 10,000 m² on a single charge 40-60 times faster than manual spraying. The DJI Agras MG-1 is dust proof and corrosion proof. It's also water resistant so at the end of a spray. It can be rinsed clean. Its extreme reliability as possible through a specially designed internal cooling system. Air enters from the front and mist dust and large particles are filtered out. Before reaching the motors, where heat is then dissipated into the surrounding air. Industry standard ceramic nozzles come pre-installed and can be swapped out if necessary. Spray quality is further enhanced with a downward facing radar that keeps the DJI Agras MG-1 at exactly the right height above the crops. Using the DJI Agras MG-1, modern farms can spray faster, more accurately, and more efficiently bringing the DJI powered aerial revolution to agriculture. AeroVironment (AV)’s goals are to go solve some really big problems in the commercial area. One of those areas is in agriculture, the challenge there is that by 2050 we'll need to double the amount of food production to feed all the people on the earth. The constraint that we have is we'll only have 30% more land in order to grow on. That means that the food efficiency our growers efficiency has to increase substantially. Drone technology and data system are a part of the solution. AeroVironment has taken pieces of the various sensors ideas and concepts and developed purpose-built and highly integrated system into one intimate small package. That's very simple, very easy, very efficient for farmers. 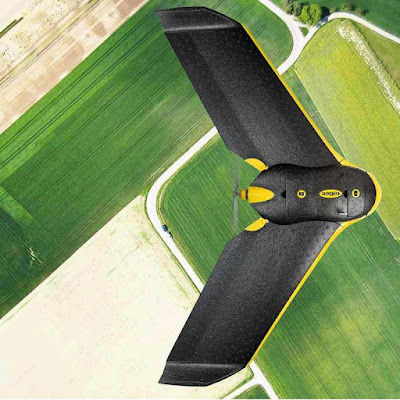 AV developed Quantix to meet the needs of the growers and the energy infrastructure and transportation enterprise users because flying current UAVs is expensive in terms of labor and it's limited in terms of flight duration using the existing technologies. The concept of Quantix uses the quadcopter for vertical takeoff and landing and then transitions to horizontal forward flight. And therefore Quantix can cover much greater areas of land than a standard vertical takeoff and landing quadcopter. One of the differences for Quantix when compared to our military UAVs is the simplicity. And Quantix is designed to be a system that makes it as easy as possible for an untrained user to operate the system out-of-the-box. Quantix has automated mission planning where you designate the area that you want imaged a one-button launch and automated landing back at the launch spot. Quantix is designed to cover 400 acres with near IR and visible imagery over about 45 minutes. The Quantix sensors contain a high-resolution RGB for conventional photography and a multispectral camera that will give you the conventional NDVI and GNDVI sorts of indices together. They give you a variety of analytics that can help precision AG really take off and flourish. Quantix will allow you to do a quick look of your data well you get access to all of the high-resolution imagery, and summary NDVI of your field, and be able to do a quick assessment out in the field. AeroVironment decision support system is a web-based analytics platform. It provides an intuitive set of capabilities and analytics to farmers that includes trend analysis to do comparative analysis to see how things have changed. This is not new for environment. 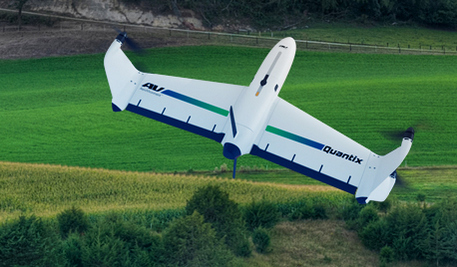 With the Quantix UAV and the decision support system, this Quantix provides the data analytics. It's built in a way and designed in a way that it all works together to yield the right result at the back end. And that's really the goal is to provide them something that's so simple to use that they can just go out and get their jobs done. Preparing the winter wheat for fertilisation. This particular field was chosen because of its variability. The eBee Ag Drone was used to capture near-infrared images of the field. In one day this UAV can map up to 1,000 hectares (2,471 acres). The drone flew a fully autonomous flight. Its progress was monitored via its eMotion ground station software. The drone's soft landing was also autonomous. The crop survey's result showed a strong imbalance in plant development across the field. The precise timing of fertilisation per crop stage was found to be critical. The NDVI map of crop health enabled the team to create a fertiliser application map, used to distribute the appropriate amount in each zone. The fertiliser was spread using an Amazone ZA-M 1500, with a working width of 24 m (79 ft). An Amazone mobile test kit was used to achieve perfect uniformity when spreading. 22 ha (54.4 ac) were fertilised in total, based on the application map, at a rate of 0 - 189 kg (0 - 416 lb) per hectare. Intermediate analysis of results Finding: reducing the fertiliser application rate in areas of poorly developed crop was justified. This led to 20% less fertiliser being used. 0 Response to "Top 3 Drones Helping to Support Global Growth of Sustainable Agriculture and Food Production"